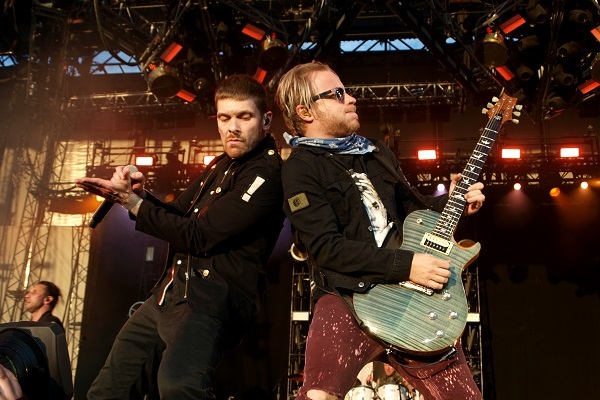 Shinedown has reclaimed their title as the rock band with the most top 10 Billboard Rock Airplay songs. Brent Smith and company’s latest single, “Get Up,” is the song that secured the guys the honor, as the catchy, anthemic tracks has inched its way into the top 10 on the Billboard Rock Songs Airplay chart. The Rock Airplay category was created nine years ago, and Shinedown had held the title of the most top 10 singles for years, until Dave Grohl and Foo Fighters beat them by scoring four consecutive entries in 2015 and 2016. While Shinedown rocked the charts those years, the guys had a handful of songs that almost made it into the top 10, but not quite. With “Get Up” making it into the top 10 on the Billboard Rock Airplay songs chart, Shinedown now has 11 songs in the top 10. Foo Fighters currently have 10, and they’re followed closely behind by Cage the Elephant and Muse at nine and Imagine Dragons at eight. “Get Up” is also currently No. 2 on the BDS Mainstream Rock National Airplay chart. Sitting at No. 1 on the list is Disturbed’s “Are You Ready?” Three Days Grace currently has the chart lead for the most No. 1’s on that chart, as the band broke a tie with Van Halen earlier this year. If “Get Up” hits No. 1 on that tally, Shinedown will tie Van Halen for the second most. No. 1’s on the chart at 13, just behind Three Days Grace’s 14 No. 1 songs on the chart.